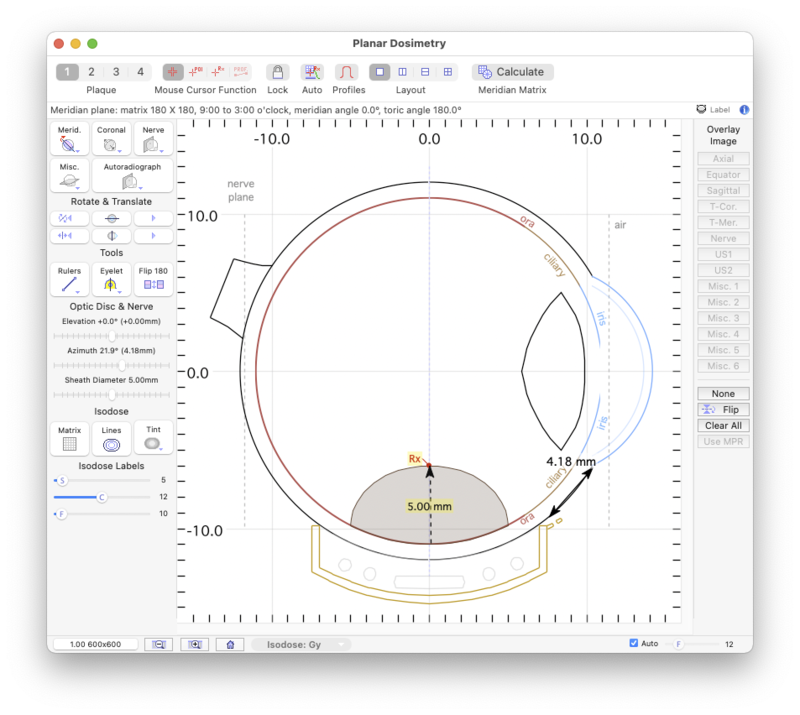 The Planar Dosimetry window displays isodose maps, plaque(s), points of interest, dose profile lines and anatomy on planar cross sections of the eye. 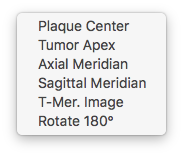 The default display is a single pane illustrating a meridian plane bisecting the eye through the center of the active plaque. The meridian planne can be rotated about the AP axis of the eye. A coronal plane that, by default, bisects the eye at the equator may be also be displayed instead of, or in addition to the meridian plane. Controls to rotate the meridian and translate the coronal plane are provided. The planar cross sections may optionally be superimposed over calibrated CT or MR images. The status line just below the window title bar lists the currently active dose matrix set, surface, matrix size and surface orientation or offset from the equator. Points of interest (POI) and a user defined prescription (Rx) point may be digitized by enabling the appropriate cursor mode and clicking on the diagram. A ruler tool allows measurement between points. In the example on the right, a chord distance of 4.18 mm between the limbus and the projection onto the outer scleral surface of a suture eyelet is illustrated. Additional control over 2D isodose plotting is provided in the Plot menu. The toolbar buttons near the top of the window select the dose matrix set, cursor function, and window layout. Plaque 1..4 - Selects the plaque (and its associated dose matrices) that is currently "active". Sets the cursor mode to display information about the point clicked. Sets the cursor mode for digitizing points of interest (POI). Sets the cursor mode for digitizing a Rx point. Enabling the automatic (live) Rx updating control in the toolbar (or holding down the option key while dragging the Rx point) will automatically rescale isodose lines and seed strengths in order to maintain the current Rx conditions while the Rx point (or a Rx POI) marker is dragged on the plane. The dose histogram is also automatically updated. The current 2D plane must intersect the Rx point (or POI) in order for the point markers to be visible. If the current Rx mode is a plaque or tumor axis distance, the dragged Rx point will be constrained to the appropriate axis during the drag and might disappear from the window because it no longer intersects the current plane. For all other Rx modes, the Rx will be automatically changed to absolute coordinates mode at the beginning of the drag. Displays only the currently active dosimetry set. To facilitate rapid dosimetric comparison of prospective plaque designs, Plaque Simulator supports 4 plaques and 4 dosimetry sets per patient. By default, each dosimetry set is associated with a corresponding plaque. Set 1 is associated with plaque 1, set 2 with plaque 2, and so on. Only one plaque (and its dosimetry set) at a time are normally considered to be "active". Changing either the active plaque or the active dosimetry set autmatically changes both the plaque and its associated dosimetry set. (This behavior can be disabled in case you wish to apply all four sets to the same plaque). Displays side-by-side meridian and coronal dosimetry for the active dosimetry set. Displays stacked meridian and coronal dosimetry for the active dosimetry set. Displays meridian or coronal all four dosimetry sets. The profile bar buttons activate dose profile lines. 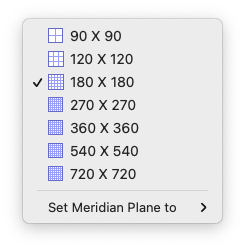 Meridian - Makes the meridian plane the active context when in single pane layout mode, the popup menu selects dose matrix size and some standard plane locations. Coronal - Makes the coronal plane the active context when in single pane layout mode, the popup menu selects dose matrix size and some standard plane locations. Flip 180 - Flips the meridian plane 180° to match MPR images. Equator - Translates the coronal plane to the equator. Meridian CCW - Rotates the meridian plane CCW. Meridian CW - Rotates the meridian plane CW. Coronal Anterior - Translates the coronal plane towards the cornea. Coronal Posterior - Translates the coronal plane towards the fovea. Ruler - Enables display of the distance measuring ruler tool. Use the contextual menu to customize ruler properties. Ruler Properties... - Opens the ruler properties sheet where you can customize ruler properties and enable multiple rulers. All rulers share a common calibration. Rx Point Distance - A special ruler that plots and labels a vector between a location of interest and the Rx point when that vector lies entirely in the plane. Rx Point Properties - Opens a sheet in which you can customize the Rx Point Distance tool. Eyelet - Cycles the meridian plane to pass through the next suture eyelet, or move directly to a selected eyelet via the contextual menu of this button. A1 etc... - Rotate the meridian plane to pass through the selected eyelet. This menu's appearance varies with the number of eyelets attached to the current plaque. Tint Contextual Slider - Adjusts isodose tinting opacity. Isodose labels spacing slider (S) - Interactively adjusts the initial default location of isodose labels before any shifting required to prevent overlap. Isodose labels clustering slider (C) - Isodose labels on the plane gravitate towards the center of the eye but are not allowed to overlap. This slider interactively adjusts the allowed proximity between isodose labels. Isodose labels font size slider (F) - Interactively adjusts the isodose label font size. Calc. 2D Mat. - Convenience button to recalculate all 2D matrices and the dose histogram. Same as clicking Calc. 2D Matrices in the Dosimetry Menu menu. Axial - Overlays the plot on a calibrated axial image. Equator - Overlays the plot on a calibrated equatorial image. Sagittal - Overlays the plot on a calibrated sagittal image. T-Cor. - Overlays the plot on a calibrated tumor-coronal image. T-Mer. - Overlays the plot on a calibrated tumor-meridian image. US1 - Overlays the plot on calibrated ultrasound image #1. US2 - Overlays the plot on calibrated ultrasound image #2. None - Draws the plot over a plain white background. Flip - Vertically flips the selected image. Clr All - Clears all image overlays. Reduces the plot size by a factor of 2. Enlarges the plot by a factor of 2. Resets the plot to its standard settings.